If you love wine, why not order your own batch? Enjoy great savings as well as the luxury of your own special vintage. Indulge yourself with a Private Label, to commemorate your special occasion, or just to salute your own style! 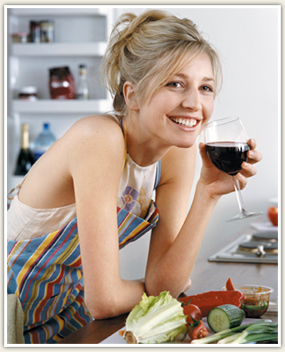 Making your own batch of wine at CarafeTM is a rewarding experience. It only takes a few minutes to get things started. And, you'll have peace-of-mind knowing that your satisfaction is guaranteed! Most of our batches yield 30 - 750 ml. bottles (23 litres). Depending on the wine you choose, it will be ready in 4 to 8 weeks. Our friendly staff at CarafeTM will assist you in getting set up. Bring friends and family and make a party of it! It is safe, easy and fun to do. Finish off with your label and you will have a custom batch to be proud of! Your wine will be ready to drink but can only improve with age. Rest assured that while your treasured vintages are waiting to be used, their quality and value are increasing. Save even more by joining with friends and using our Group Discount. You can SAVE 10% when you make 5 batches or more! This way everyone can enjoy a variety of wines at tremendous savings! If you are proud of the food you lovingly prepare for your friends and family, be proud of the wine you serve with it! BE PROUD OF YOUR WINE!